At the same time San Francisco was growing fast, and was filled with the flimsiest, most flammable wooden buildings imaginable. By 1850 huge fires began to rake the city and while they leveled block after block criminals would loot the homes and businesses of the good citizens who were out trying to fight the flames. The first vigilance committee formed in 1851 after the fifth fire simply because the city government would do nothing to protect the people. The committee, made up of most of the leading citizens and with the backing of almost every honest person, hung a few men and chased a lot more out of town. Within months things improved dramatically and the committee disbanded. But it’s hard to keep crooks that are in cahoots with corrupt politicians under control for long and by 1855 things were in terrible shape once more. Gold production was down, voting fraud was rampant, banks and business failed, a city supervisor slipped out of town just before his imminent arrest for a major real estate scam involving city money and a pier we now know as Fisherman’s Wharf. James King of William, a once well-known banker who had lost everything in the collapse of 1855 was now running a small newspaper, The Evening Bulletin, devoted to exposing the corruption in the city. King was fearless in his reporting and ruthless but impartial in his editorials. Yet things were still a mess in 1856 when the gambler, Charles Cora, took his doxy, a high powered and wealthy Madame called Belle, to the theater. 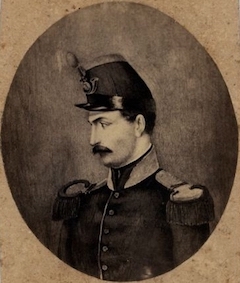 By her presence she offended the young and ambitious US Marshal Richardson and a heated dispute arose between the two men. 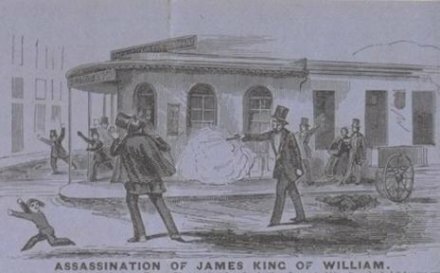 Then, days later, after that dispute was resumed in a local saloon, Cora shot Richardson in the chest in cold blood at point blank range. 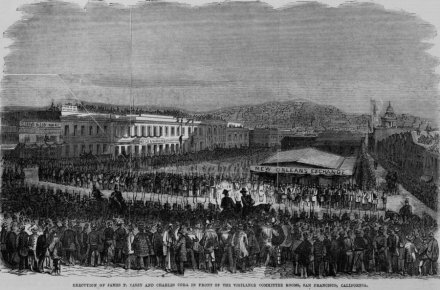 King denounced the city officials who were holding Cora for trial, saying that the man could not be found guilty of even such a blatant crime in a city as corrupt as San Francisco. And as King predicted, amid charges of bribery, the jury in the trial of Charles Cora could not reach a verdict and Cora had escaped his punishment for murder. King then went after James P. Casey, a city supervisor, and exposed him as having once been a prisoner in New York’s infamous Sing Sing prison. Casey was incensed and on May 14th stormed into the offices of the Bulletin and protested loudly. King ordered him out. Casey went but waited just up the street. An hour later, when King left for the day, Casey walked up to him in the middle of Montgomery Street and shot him down with a Navy Colt. The news spread fast. Tens of thousands of people soon gathered. Casey, joined by his powerful friends, went straight to the jail where Cora was still held for his own protection. Soon the crowd arrived. The local militia was called in to guard the place and there was no trouble that night. The next morning members of the old Committee of Vigilance met and by the time King died on May 20th a new committee had been formed and already had 3,500 members. By now most of the militia sided with the vigilantes, so when the committee marched in mass to the jail and surrounded it, the jailers soon were soon persuaded to turn Casey over. A short time later the committee returned for Cora. 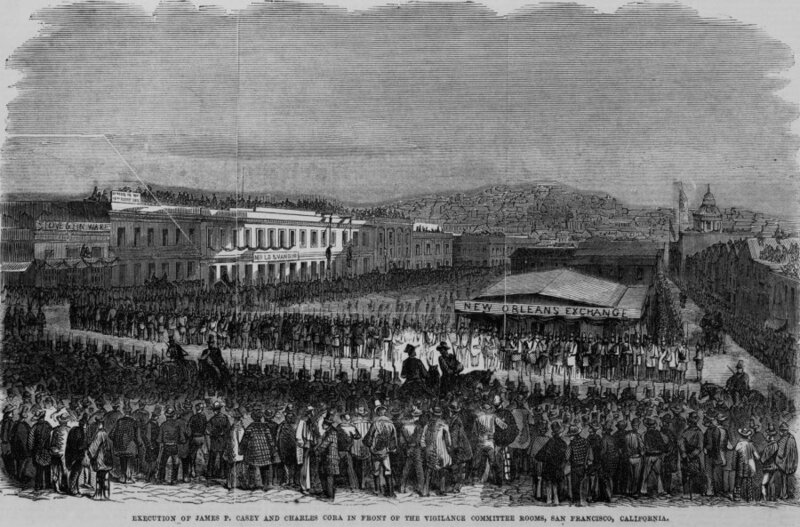 The prisoners were taken to the committee’s headquarters, known as Fort Gunnybags, on Sacramento Street and held there under guard. 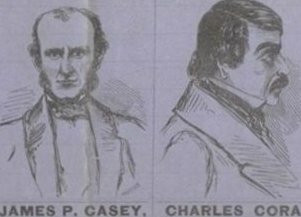 Both men were appointed lawyers and put on trial by the vigilantes. Each was convicted with a unanimous verdict. 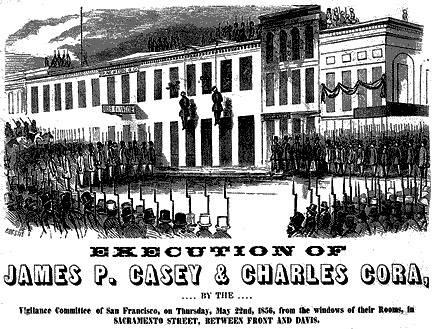 On May 22nd they were hanged from short platforms extending from second floor windows of Fort Gunnybags before an enormous crowd of San Franciscans who filled the streets, buildings and roof tops all around. The Committee of Vigilance continued to operate until they were convinced that all corrupt politicians and crooks had been purged from city. This resulted in a wholesale change of the political power in San Francisco. John Putnam is the author of Hangtown Creek, an exciting tale of the early California gold rush. His rich history of that incredible era at can be found at mygoldrushtales.com. 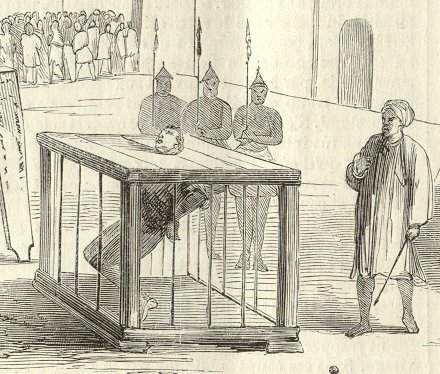 On February 29, 1856, local Chinese officials in Guangxi beheaded French missionary priest Auguste Chapdelaine — and handed his countrymen a pretext for war. Chapdelaine (English Wikipedia page | French) had gone illegally to the Chinese interior to proselytize Christianity. 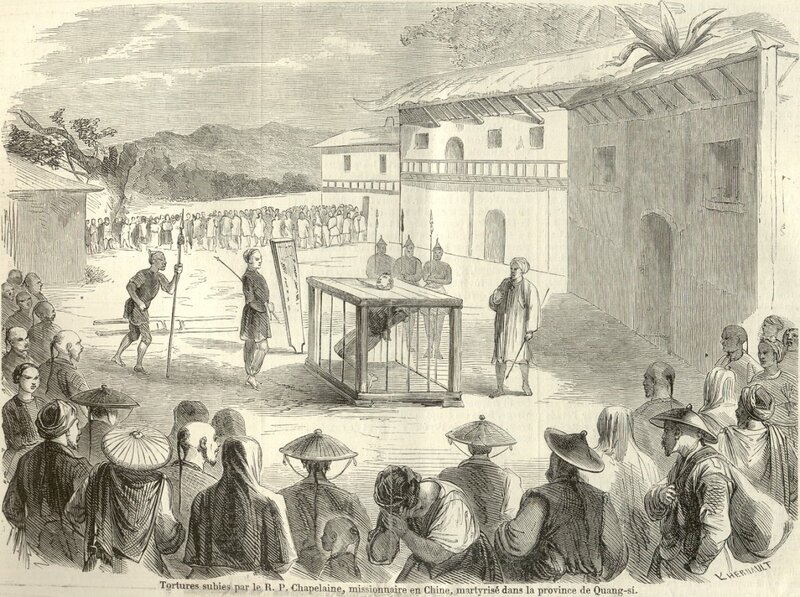 The local mandarin Zhang Mingfeng was no doubt disposed to take such an harsh line against this provocation by virtue of the ongoing, Christian-inspired Taiping Rebellion, which had originated right there in Guangxi and was in the process of engulfing all of southern China in one of history’s bloodiest conflicts. Pietistic accounts of believers’ last extremes are here and here. 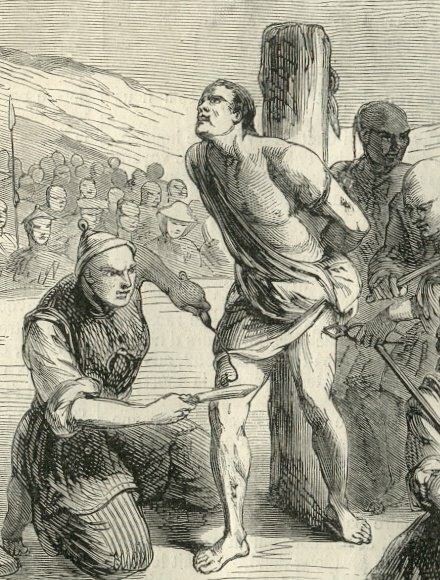 It took months for word of this martyrdom to reach French consular officials, and many months more for the gears of international diplomacy to turn — but when they did so, France pressed a demand for reparations. 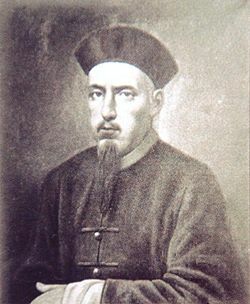 Since pere Chapdelaine had been acting illegally in the first place, the Qing’s obdurate Viceroy Ye(h) adamantly refused to offer Paris satisfaction. By 1858, this intransigence sufficed to license French entry (alongside Britain) into the Second Opium War, from which the Europeans won by force of arms a noxious treaty guaranteeing their right to push Christianity in China, extracting a couple million silver taels in damages, and (of course) assuring their right to traffic opium into China. It would be rather ungenerous to hold all the ugly imperial consequences personally against our day’s martyr. August Chapdelaine was canonized by the Catholic Church in 2000 as one of 120 Martyrs of China. 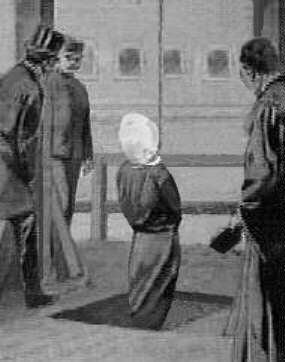 On a drizzly morning this date in 1856, Elizabeth Martha Brown (or Browne) was hanged for murder as a young and fascinated Thomas Hardy looked on. Brown was born Clark(e), but she took the name of a husband 20 years younger than she, which is how she got into this mess. In due time, John afflicted their already-tempestuous wedded life with an affair — courtesy of one Mary Davis, a young woman stuck in her own unhappy May-December marriage. He then kicked out the bottom of the chair on which I had been sitting, and we continued quarrelling until 3 o’clock, when he struck me a severe blow on the side of the head, which confused me so much I was obliged to sit down. He then said (supper being on the table at the time) “Eat it yourself and be damned,” and reached down from the mantelpiece a heavy hand whip, with a plaited head and struck me across the shoulders with it 3 times, and every time I screamed out I said “if you strike me again, I will cry murder” He replied “if you do I will knock your brains through the window,” and said hoped he should find me dead in the morning, and then kicked me on the left side, which caused me much pain. He immediately stooped down to unbuckle his boots, and being much enraged, and in an ungovernable passion at being so abused and struck, I seized a hatchet that was lying close to where I sat, and which I had been making use of to break coal for keeping up the fire to keep his supper warm, and struck him several violent blows on the head – I could not say how many – and he fell at the first blow on his side, with his face to the fireplace and he never spoke or moved afterwards. Unfortunately, this confession broke a protracted* attempt to stick to an implausible “the horse kicked him dead” story whose maintenance seriously complicated any bid to secure clemency for the woman. She received, instead, a different kind of life: literary immortality that hardly any in Dorchester that gray morning could have aspired to. Thomas Hardy, not yet the canonical novelist famous enough for his own Monty Python sketch but a 16-year-old architectural apprentice, was among the three or four thousand who braved the inclement weather to witness Brown’s hanging** — the mandatory sentence then for a circumstance the courts would handle differently today. Even seven decades later, Hardy could recall the vividly sensual effect of this macabre scene. I saw — they had put a cloth over the face — how, as the cloth got wet, her features came through it. That was extraordinary. I remember what a fine figure she showed against the sky as she hung in the misty rain and how the tight black silk gown set off her shape as she wheeled half round and back. “Justice” was done, and the President of the Immortals, in Aeschylean phrase, had ended his sport with Tess. * Everything is relative, of course. In Brown’s instance, less than five weeks separated murder from execution, so she had scarcely had time to be obstinate about withholding the confession. ** Brown was said to have died with great firmness, and the report from the scaffold brings us the classically Victorian detail that executioner William Calcraft, having departed the platform to spring the trap after pinioning his prisoner, was obliged to make a return trip when he realized he’d forgotten to tie down her dress against any immodest billowing. An ironic precaution, given that we remember this hanging precisely because of Hardy’s captivation with the more refined eroticism of the “wet hanging gown contest” tableau. Part of the Themed Set: Thomas Hardy. And John Parsons Cook, whom Palmer was finally convicted of killing. Evidence against Palmer was completely circumstantial, the public mood was completely prejudicial, and the case was completely sensational. It didn’t help Palmer’s cause that future Lord Chief Justice Sir Alexander Cockburn was on the case, inflicting a withering cross on the defendant. Neither did it help his cause as much as one might think having the victim’s body come up negative for any lethal dose of poison. Robert Graves wrote a book about the case, and reckoned it a likely frame-up. Most other popular recollections — like Madame Tussaud’s, where Palmer stood until 1979 — have figured him for the same cold-blooded poisoner his public thought him. Gambling debts on the verge of burying him afforded him very plausible motivation (Cook was supposedly killed because Palmer had fraudulently borrowed a few hundred pounds against his name and was about to be found out). How quickly “crimes of the decade” fade away. Palmer was the O.J. Simpson of the 1850’s, although his spell in the public eye was only a few months. Parliament had to intervene to move his case from Staffordshire to London for want of an unprejudiced jury; 35,000 people crammed the streets overnight in the rain to watch him swing; and time was you could get yourself the Unabridged Edition of The Times‘ minute-by-minute report on the Palmer trial or bone up on the case in the 19th century’s legal tomes, to say nothing of the requisite (and in this case, poetic) broadsheet and enough cultural ejecta to stock a museum exhibit. Legend — scurrilous, of course — has it that his hometown of Rugeley even petitioned the government to change its name for fear of never escaping its association, but that the change would only be permitted if the town named itself after the Prime Minister: Lord Palmerston. Rugeley it remains. * Notably, Palmer was convicted of poisoning in the face of exculpatory toxicology evidence. He denied the poisoning to the end.